Giving Day teams and donors took the time to relax and pose for pictures at a photo booth set up at Quarry Plaza last week. Photo by Carolyn Lagattuta. Donors set a high bar during last year's Giving Day, a 24-hour online festival of giving, with donors kicking in $520,000 for 122 worthy projects. But this year, donors did more than just reach the previous bar. They took the bar and flung it in the air. Breaking previous records, Giving Day 2018 yielded more than $600,000 with more than 6,300 gifts for 160 projects, according to preliminary tallies. The third annual Giving Day used an appealing format to keep the gifts rolling in; the contest pitted teams of donors against one another in a good-natured sprint to the finish line, with the tension building as the clock wound down to the midnight deadline. Donors and curious onlookers could look at the interactive and constantly updated Giving Day website and track the results in real time. Every gift was tallied, ranging from online pledges to pocket change to beefy checks handed to team members in person at Quarry Plaza, where Giving Day participants set up booths. Matches, created by donors, created strong incentives to give. “Challenges,” also funded by donors, pitted project teams against each other in a lighthearted way, creating bonuses for those that raised the most money in restricted time elements—from 5–7 p.m., for instance. While many participants were new to Giving Day, a few of last year’s contest winners were back in action. For instance, Formula Slug, a student-run, nonprofit sustainable engineering organization, specializing in student-designed electric race cars, performed very well last year, winning the Final Frenzy Challenge and a bonus $10,000. This year, they also sped to the finish line, winning the “Slug Surprise,” adding $5,000 to their project, which raised an impressive $17, 259. The Gail Project, which delves deeply into the history of the Pacific island of Okinawa, came out on top in terms of overall donations—367 of them, raising more than $21,000—making this organization one of Giving Day’s true “campaign heroes.’’ The Gail Project organizes research trips to the island and has created exhibits on campus that have drawn hundreds of visitors. The project will use this bumper crop of donations to fund new internships and help pay for another trip this summer. The top overall money-raiser was the Smith Society, which raised $37,000 towards a special fellowship to honor the memory of Calli Joy Morrow (College 10, '17), a Smith Collegiate Fellow who died on January 13. The fellowship will go towards one current Smith Collegiate Fellow, annually, who demonstrates a special interest in community service. The Center for Public Philosophy, which garnered more than $36,000 from 328 donors, came in at a close second in terms of overall fundraising. The center uses community programming, events, and media to empower communities with the tools and insights of philosophy and the science of cognition to foster thoughtful dialogue. Among its projects is “Philosophy For Children” and a program that teaches the art of dialogue to inmates at San Quentin Prison. The Center for Public Philosophy also won the "Final Frenzy,'' winning $10,000 by attracting the largest number of invididual donors (no repeats) to support their project. On Wednesday, potential donors went from booth to booth at Quarry Plaza, checking out the various teams, writing checks, accepting informational brochures, and enjoying the wild assortment of free swag, ranging from decals and stickers to pre-wrapped Pacific Cookie Company treats. The strawberry experiments took place in a booth that raised money and awareness for Women In Science and Engineering (WiSE), which encourages, nurtures, and advances women in the STEM fields. The booth also raised awareness about the Treehouse Childhood Cancer Initiative, which supplies oncologists with genomic data that helps them choose targeted treatment options for young cancer patients. Apparently those strawberries enticed some serious gift-giving; WiSE ended up raising more than $4,000 on Giving Day. But she took comfort knowing she was raising money that would help create the same experience for other students, funding uniforms, everyday expenses, and travels to away games to colleges including Cal State Chico, UC Davis, and UC Santa Barbara. Sol raised a total of $6,315 with 19 donors contributing generously. 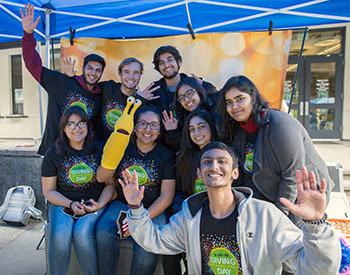 Close by, in another section of the quad, Krishnan Nair (College 10 ’20, computer science), was raising money and awareness for UC Santa Cruz’s Indian Student Association. Specifically, the money was going toward the Holi Festival, a colorful and energetic gathering that will take place at 2 p.m. April 13 on the OPERS East Field. While many projects reaped dividends in this year’s Giving Day, the process was also rewarding and invigorating for donors. Even certain alumni with a long and illustrious track record of giving to the campus could not resist taking part in the action this year. One prime example is Robert Holo (Crown ’87, history, East Asian studies), a UC Santa Cruz Foundation trustee and donor. He, along with his wife, Christine (Oakes ’90, biology), gave $1 million in 2012 to support the Center for Ocean Health at Long Marine Lab, a premier research facility for coastal conservation, policy, and research. In fact, he was so impressed that he ended up giving to “a whole bunch” of projects—14 in all, including Año Nuevo Island: Elephant Seals Project, Coastal Conservation Action Lab, the Predatory Bird Group Education Outreach Program, and Women in Science and Engineering. Like many other Giving Day donors, Holo, known as a leading lawyer on federal income tax, loved the idea of paying it forward.